Is your tween or middle schooler looking for an edgy, sinister book? I’m asked every day for “scary” books and usually lead my students to my ghost story collections. But, for those kids who don’t mind dark books, read A Series of Unfortunate Events, tore through the Cirque du Freak series and are looking for more, Malice could be the answer. It is sinister, so I’d suggest middle school for this book. I read Malice in one sitting. It was that good. This smart, but scary book is part novel, part graphic novel, part fantasy. 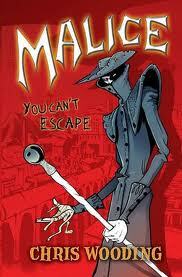 Malice is about high school kids caught up in the mystique surrounding a comic book called Malice. It is said that kids who perform a ritual to call the main character, “Tall Jake” disappear, sometimes for months and sometimes forever. The pages of Malice, if you can get your hands on a copy, show the kids who have disappeared fighting for their lives in a strange fantasy world. Little do the kids who do the ritual know that Tall Jake is real, the world of Malice is real and as terrifying and deadly as the comic book makes out. Those that come back from having disappeared don’t remember a thing about the time they were away. Because no one remembers Malice after they return, no one can warn the other kids about Malice and the dangers of calling Tall Jake. Seth and his friends, once in Malice, fight for their lives and swear that they will find a way to stop Tall Jake. This book has a sequel called Havoc which continues the story of Seth’s fight against Tall Jake. There are many that I can’t put down, too.